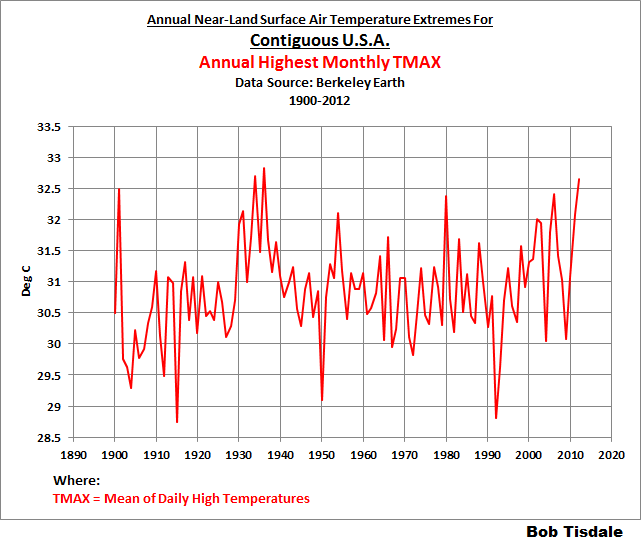 I was preparing a post using Berkeley Earth Near-Surface Land Air Temperature data that included the highest-annual TMAX temperatures (not anomalies) for China…you know, the country with the highest population here on our wonder-filled planet Earth. 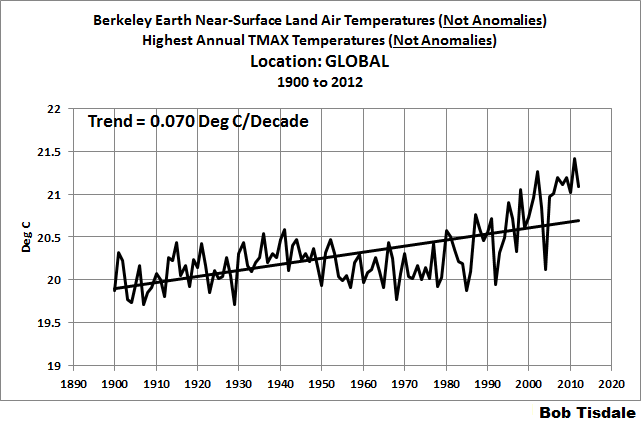 The graph was for the period of 1900 to 2012 (FYI, 2012 is the last full year of the local TMAX and TMIN data from Berkeley Earth). 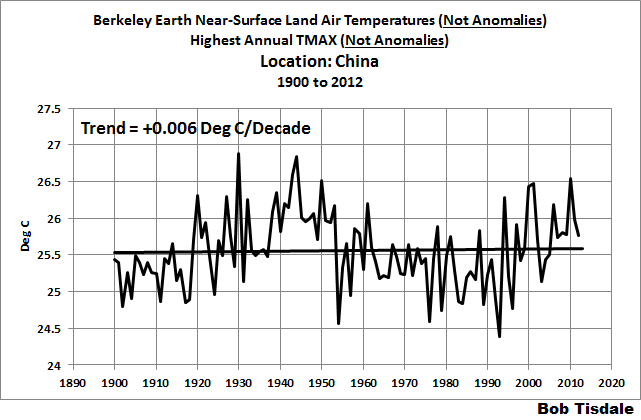 Berkeley Earth’s China data can be found here, with the China TMAX data here. For a more-detailed explanation, referring to Figure 1, I was extracting the highest peak values for every year of the TMAX Data for China, but I hadn’t yet plotted the graph in Figure 1, so I had no idea what I was about to see. The results are presented in Figure 2, and they were a little surprising, to say the least. How wrong are the answers if you use anomalies, you ask? 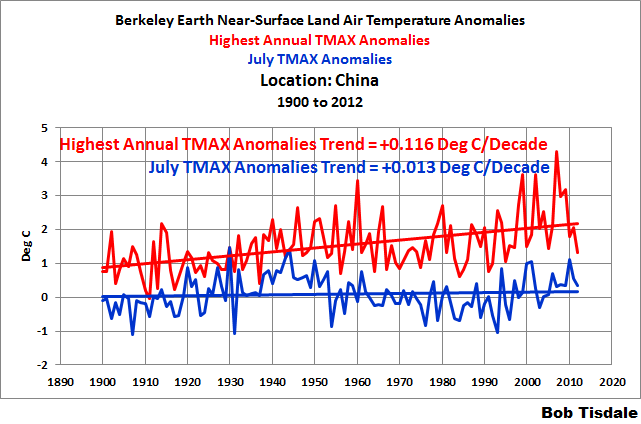 Figure 4 presents the highest annual TMAX temperature anomalies (not actual temperatures) for China, along with the annual July temperature anomalies (not actual temperatures), both for the term of 1900 to 2012. The highest annual TMAX temperature anomalies (not actual temperatures) for China show a noticeable warming rate of 0.12 deg C/decade, when, in reality, no long-term warming of the actual highest annual TMAX temperatures existed during that period. Referring to the Berkeley Earth TMAX webpage for China, July shows the highest value of the monthly temperature conversion factors listed. As also shown in Figure 4, the July TMAX temperature anomalies for China give a better answer, but still not the correct one. 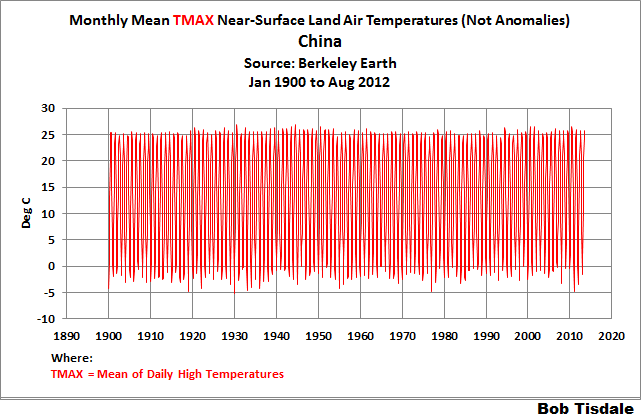 Obviously, the highest annual TMAX temperatures for China don’t always occur in July. For the sake of illustration, I ran through the same process with the GLOBAL near-land surface air TMAX temperature data from Berkeley Earth. The same basic problems exist with the global highest annual TMAX anomaly data, but the July TMAX trend values are correct. See Figures 5 and 6. 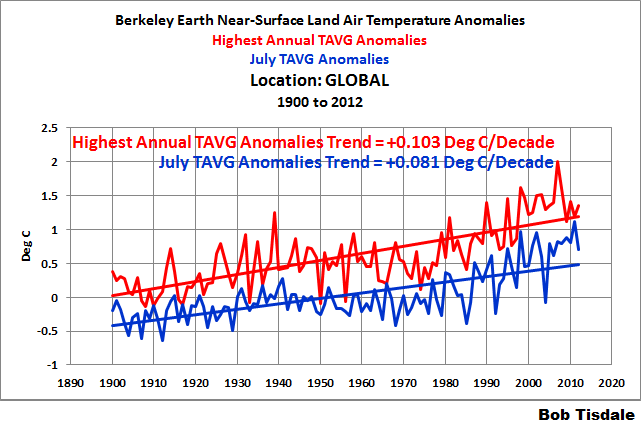 While we’re on the subject, do not go looking for “Mean of Daily High Temperature” (TMAX) answers using average monthly (TAVG) temperature data, Berkeley Earth’s standard near-surface land air temperature anomaly dataset. The TAVG data are the wrong data to use from Berkeley Earth when looking for TMAX answers. That’s it for this post. It gave me the opportunity to present Figures 2 and 3 in advance of the post I’m preparing. Enjoy yourself in the comments below, and have a great rest of your day. And please purchase Anthony Watts’s et al. Climate Change: The Facts – 2017. To those of you who have purchased them, thank you. To those of you who will purchase them, thank you, too.